An objective process of prioritisation was undertaken in order to select the final commodities for detailed value chain analysis. The information collected in the commodity literature reviews and briefs, consultation feedback and the Socio-economic review was used to inform the commodity prioritisation process. In order for the commodities to be prioritised, selection criteria were established and then weighted according to their level of importance to the achievement of AIP-PRISMA (PDF 344 KB) goals. The selection criteria used to prioritise the commodities incorporated issues such as integration of the poor into markets, product potential for growth, opportunity for scaling up, risk, number of households impacted, poverty incidence and extent. Consideration was also given to factors such as environmental impact, long-term sustainability and gender. The final commodity ranking (commodity score multiplied by weighted criteria) is presented below. 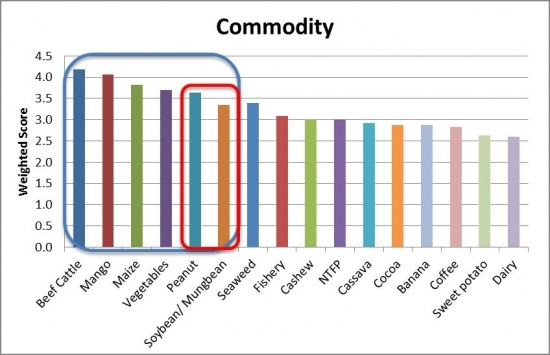 The commodities (circled in blue) that provide the greatest likelihood of achieving the goals of AIP-PRISMA (PDF 344 KB) were beef cattle, mango, maize, vegetables, peanut, soybean/mungbean. The Reference Group decided to group together peanut, soybean and mungbean (circled red) and reclassify under the one commodity group of legumes. The project team developed individual scores between 1-5 against the selection criteria for each of the 16 commodities. In the tables below, each score has been hyperlinked to the relevant section in the commodity briefs to conveniently view the rationale behind each of the scores.